OnePlus 3T vs Samsung Galaxy S7 Release Date, specifications ,features ,camera ,fingerprint sensors, build design. display and know the detail of battery, storage ,compare size and price full comparison review in the USA,UK and India. 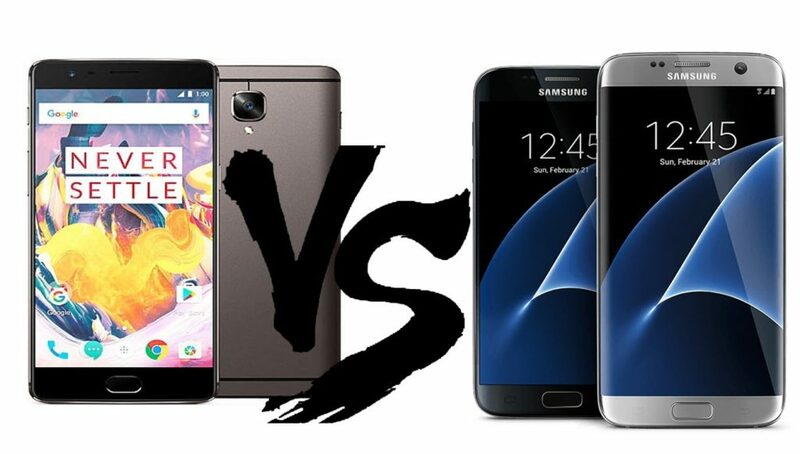 How both devices different from each others and which is better for buy in budget.Samsung Galaxy S7 T-mobile ,Sprint ,Verizon Wireless, AT&T,Amazon Specs and price comparison. Colors Gunmetal and Soft Gold Black Onyx, White, Gold, Silver, Pink Gold. Display 5.5-inch (1920×1080 pixels) Full HD Optic AMOLED display with 2.5D curved Corning Gorilla Glass 4 protection,401ppi. 5.1-inch Quad HD (2560×1440 pixels) 577 PPI Super AMOLED always-on display, Corning Gorilla Glass 4 protection. Protection 2.5D Gorilla Glass 4 and Fingerprint sensor. Gorilla Glass 4 ,Fingerprint sensor , IP68 ratings water and dust resistance. Camera Primary 16-megapixel rear camera with LED flash, Sony IMX298 sensor, 1.12 micron pixel size, f/2.0 aperture, EIS 2.0, PDAF, OIS, 4K video recording. 12MP rear camera with LED Flash, f/1.7 aperture, Smart OIS , 1/2.5″ sensor size, 1.4 µm pixel size,4K video recording. Camera Secondary 16MP front-facing camera with Samsung 3P8SP sensor, 1.0 micron pixel size, f/2.0 aperture, PDAF, 1080p video recording. 5MP front-facing camera, f/1.7 aperture, 1080p video recording. SIM Dual SIM (Nano-SIM, dual stand-by) 4G LTE with VoLTE. Hybrid SIM (nano + nano / microSD)4G LTE with VoLTE. Processor 64-bit 2.35GHz Snapdragon 821 Quad-Core Kryo. 64-bit Octa-Core Exynos 8 Octa 8890 (2.3GHz Quad + 1.6GHz Quad), Snapdragon 820 Quad-core at 2.15GHz. Storage 64GB / 128GB (UFS 2.0) storage. 32GB/64GB Internal storage and 200GB Expandable. OS Android 6.0.1 (Marshmallow) with Oxygen OS and planned upgrade to v7.0 (Nougat) Android 6.0.1 (Marshmallow) with TouchWiz UI and planned upgrade to v7.0 (Nougat). Battery Non-removable Li-Ion 3400 mAh battery with Dash Charge. Non-removable 3000mAh battery, Fast Charging both on wired and wireless (WPC and PMA) charging. Connectivity 4G LTE with VoLTE, WiFi 802.11ac dual-band (MIMO), Bluetooth 4.2, GPS + GLONASS, NFC, USB Type-C 4G VoLTE, WiFi 802.11 ac (2.4GHz and 5GHz), Bluetooth 4.2, GPS.